Illumination Cycle - Automatic 7-hour nightlight. Battery Operated - No cords Required (Up to 6 months battery life). Dual LED Lighting - Guide and Task Lighting that illuminates tank and bowl. Quiet-Close Technology prevents seat from slamming. Quick-Release functionality allows the seat to be removed quickly for easy cleaning. The straightforward design of the Branham urinal brings KOHLER styling and functionality to any application. Constructed of durable vitreous china, it is available in a palette of KOHLER colours to complement any decor. Cachet Quiet-Close Elongated Toilet Seat in White with LED Nightlight With KOHLER Nightlight technology, you can safely locate your toilet in the dark without turning on the light. This Cachet toilet seat offers a choice of two brightness levels so you can adjust the nightlight as you please. An LED guide light on a 7-hour cycle helps you see your toilet in the dark, and LED lighting illuminates the bowl when the lid is lifted. Unique Grip-Tight bumpers hold the seat firmly in place and prevent shifting. This soft-close seat also features innovative technology that prevents the seat from slamming and simplifies both cleaning and installation. 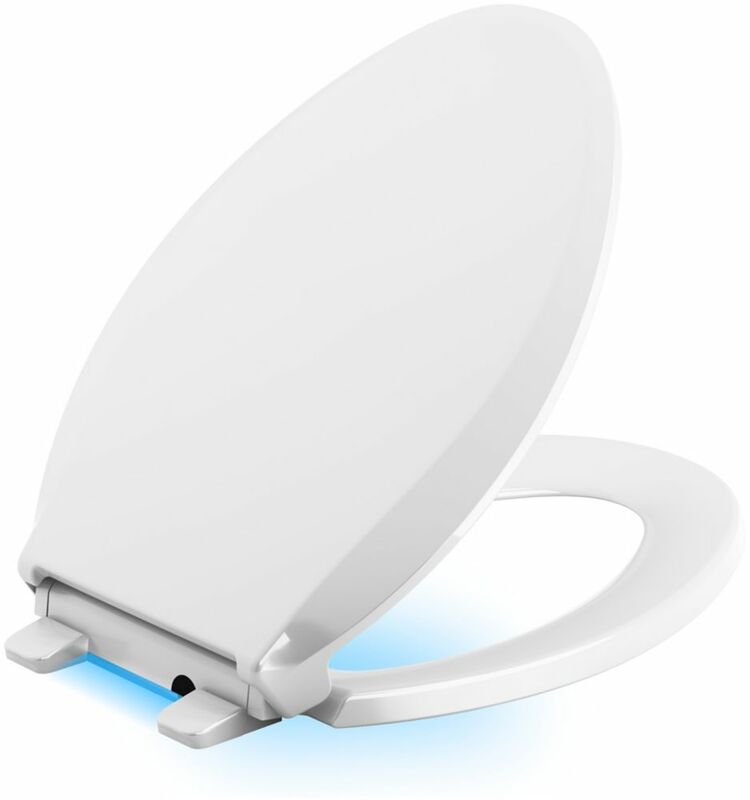 Cachet Quiet-Close Elongated Toilet Seat in White with LED Nightlight is rated 3.8 out of 5 by 443. Rated 4 out of 5 by Ogood from No complaints. The light isn’t very bright but it’s a... No complaints. The light isn’t very bright but it’s a nice color - kinda like those bioluminescent plankton blue colors . Rated 5 out of 5 by Moose from Great product, soft close and led lighting provide two great features!! Great product, soft close and led lighting provide two great features!! Rated 5 out of 5 by Julie from I don’t have to turn the light on in the... I don’t have to turn the light on in the bathroom the light on the toilet is enough so I can do my business. It turns itself off when it’s day time. Rated 3 out of 5 by Rudy from The light is adequate. It works on timer. On 10 hours a day whether used or not. I would have pre... The light is adequate. It works on timer. On 10 hours a day whether used or not. I would have preferred a motion detector system. Install was simple. Rated 1 out of 5 by Toilet from It was the wrong size. Returned it and never... It was the wrong size. Returned it and never opened the box. Rated 1 out of 5 by HomeDepotCustomer from The light didn’t work and the fact it stays on... The light didn’t work and the fact it stays on for 8 hours is ridiculous cuz it kills the batteries. I can understand 5-10 minutes but 8 hours!